There are a number of small ways you can humiliate your opponents in Counter-Strike: Global Offensive . A classic move is to knife your enemy even when it would be wiser to shoot him with a silencer, just because you can. It's a way of saying you're confident enough you can take him to have a little fun with it, like challenging someone to a fight with one hand tied behind your back. 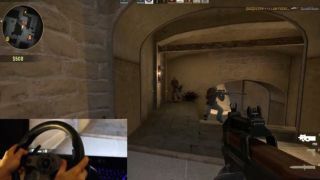 Yesterday, the folks at GameMuscleVideos took this idea to an extreme degree by playing CS:GO with a wheel controller. With the exception of some obnoxious narration, it's a pretty funny video, if only to see that it's even possible.